We’ve helped thousands of entrepreneurs get low-cost access to top-tier publicity tools that result in mega media placements. We can help you build your visibility and credibility so it is easier for you to make sales online and on Main Street. PR LEADS – Our flagship service, PR LEADS puts you in touch with reporters who are writing stories and need to quote experts like you. We literally started this business and everyone else is copying us. Imitation is the sincerest form of flattery. But we get better leads from better sources — and the odds of getting quoted are much better since we’re more selective about who we accept as clients. This is a premium service for premium companies. Yet, it is just $99 a month or $950 a year. Includes training, support and feedback. No competitor offers any of this. Click here to get started now! Press release writing and distribution – with GUARANTEED results. You could easily end up paying $3,000 and up to send your release to the top tier media. We can do it for you for much less. 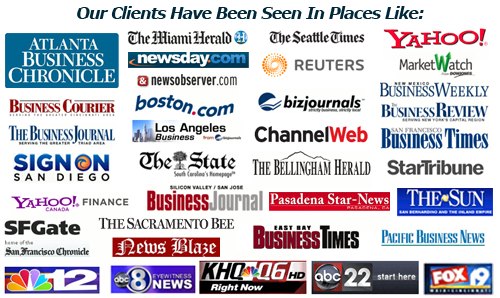 Many top sites, including business journals love to print press releases from our source, so you are virtually guaranteed to get the release printed online and reach your prospects! Improved Search Engine Marketing is a big bonus! Click here for more info. Press release writing – If you’re a good writer or have a PR firm at your disposal, we can send your press release to the top 100 media sites and dozens of reporters who cover your market. Your press release will be published on 100 media websites, and we will send you a report detailing the results. Advanced press release writing, editing, distribution, and consulting – Don’t have time to write your press release? Our staff has written more than 10,000. We’ll interview you, write your release and ask you for your comments. We’ll also optimize it for the search engines and send it out with guaranteed results. Media contact databases – Get your message into the hands of top journalists at daily publications as well as trade magazines, TV/Radio and online sites with our 500,000 person database. We’ll craft your own targeted list of reporters so you can market your message without any fluff. Prices start at $249 depending on number of markets you target. Unlike other services that charge by the number of contacts found, we’re more interested in getting you the right list at the right price! 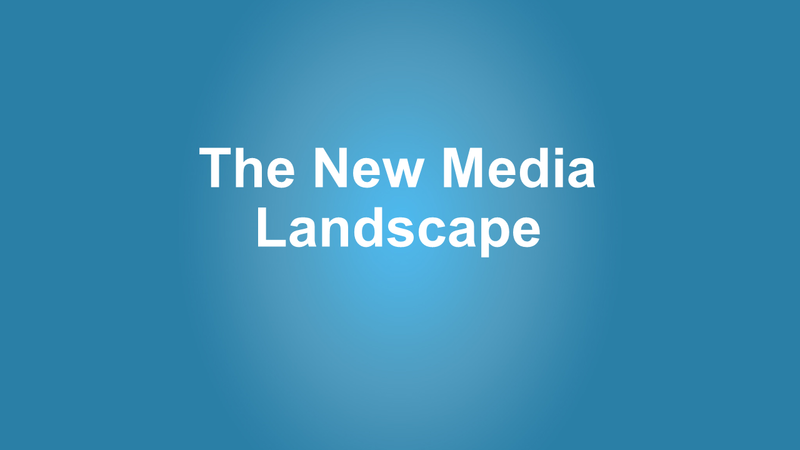 International media contacts – Need to reach reporters in Europe, Asia, South America? We have them – and the list is constantly updated so you’re assured of reaching as many reporters as possible. You’ll get name, email, phone, street address and website so you can really target your message. I help make your ideas better. If you don’t have a good idea, I help you get focused so you can find that diamond in the rough. 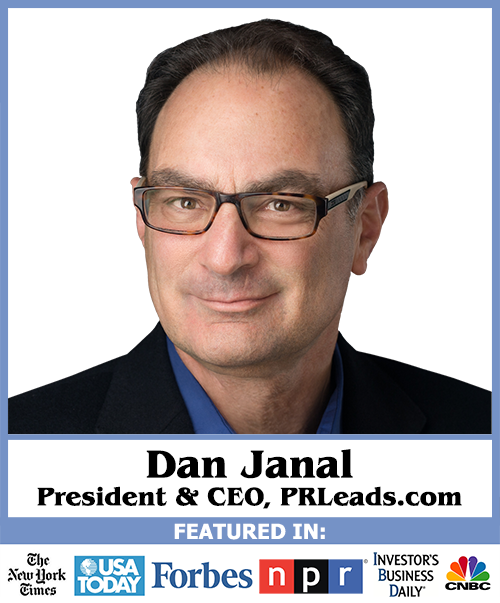 Getting started with PR LEADS to Profits you’ll work DIRECTLY with Dan Janal or his customer service manager. You won’t get that with any other media and publicity service, coaching, and consulting company. Dan is known for his pioneering work in helping literally thousands of small businesses, speakers, authors, coaches and consultants get publicity to help build their careers. He believes that publicity and marketing should be about getting results, and it shows: his clients have been featured in nearly every major newspaper and magazine. In fact, USA Today called Dan Janal “a true cyberspace marketing pioneer” because he wrote one of the first books ever written about Internet marketing way back in 1994. He was on the marketing team that launched America Online (AOL). Dan has lectured everywhere from Beijing to Budapest, as well as across the U.S., Canada, Mexico and Brazil. He’s taught at Berkeley and Stanford. He’s written and published eight books which have been translated into six languages. Get Dan Janal’s 30+ years of publicity experience and results on your side and in your corner, today.